Fifty shades of blue, hibiscus flowers surrounding azure lagoons, towering green peaks, talcum-white beaches and the most indulgent resorts all put Tahiti honeymoons at the top of our list. 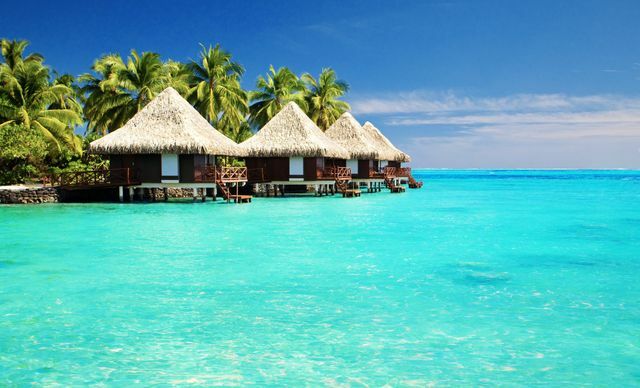 Enjoy a Tahiti honeymoon, which includes five archipelagos of 118 paradise islands in the South Pacific made up on Tahiti, Moorea and Bora Bora amongst others. Chilled Moorea offers hiking, shopping, white sand beaches and lagoon tours whilst Bora Bora offers indulgent spas on luxurious resorts on tiny, secluded islands around a lagoon. A Tahiti honeymoon is a good stop for those interested in history with sites dedicated to Captain Cook and the post-impressionist artist, Paul Gaugin and also offers chance to explore waterfalls and valleys. Foodies can delight their taste buds throughout the islands with Maa Tahiti (suckling pig) cooked in a traditional, earth oven, breadfruit or poisson cru, fish with lime and coconut milk and shouldn’t miss out on a visit to the Papeete market. Shoppers will love the chance to snap up brilliant deals on black pearls and will enjoy exploring arts and crafts villages full of woven goods such as tifaifai, carvings, sculptures and clothes. There’s decent nightlife too on the island of Tahiti itself with everything from traditional Polynesian dinner shows to drag shows and nightclubs. Tahiti is pure paradise and the perfect spot to do as much or as you little as you like on your incredible Tahiti honeymoon. March and April can be hot and rainy which means less visitors and lower prices. May sees the Billabong Tahiti Pro competition where surfers come from around the globe to the surf mecca of Teahupoo and it’s also a good time to get a deal but make sure you book your Tahiti honeymoon well in advance. June to August are the coolest and driest months and July can be very busy with the Heiva Nui festival in full swing so make sure you book well in advance . From July to November, you might catch a glimpse of the humpback whales who come to Tahiti to breed and give birth. September and October offer dry, warm weather and reasonable deals on hotels. Tahiti is on the edge of the cyclone belt and storms can occur from November to March when it is very hot with short, heavy, afternoon showers but good deals can be had. Go Horseback Riding: With options to ride across the crashing surf, along the shores of a lake and even to bathe in a lagoon. Try Barefoot Skiing: Try water skiing with a difference! For anyone who's looking into Tahiti for their honeymoon, Air France is having a 24 hout flash sale!